Caydon's first United States high rise, at 2850 Fannin St., is nearly a year away from adding 357 luxury units in a rejuvenating neighborhood of Midtown. 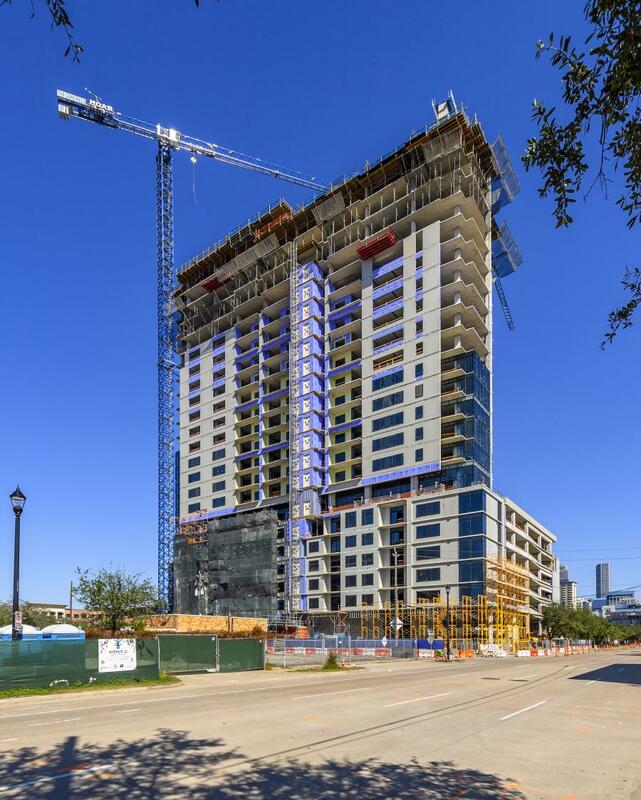 The new residential tower, which has topped out, overlooks downtown Houston and brings new retail and restaurants to the area, including Houston's first Flying Biscuit Café. Caydon celebrated the construction milestone on Dec. 6 with the construction team, trade partners, owners and design team. Hoar Construction is the general contractor on the project, and Ziegler Cooper Architects is the design team. "We put a great deal of thought and effort into our first U.S. residential tower to ensure it captures the essence of the location and it complements the surrounding community," said Derrek LeRouax, COO of Caydon. "To be topping out 2850 Fannin is a tremendous achievement, and Hoar Construction worked diligently to bring our vision to life. This momentous milestone brings us one step closer in creating a destination for people to live, work, play and visit, adding to the lively spirit of Midtown." The 27-story tower will include 357 studio, one- and two-bedroom apartments with European-style interiors and resort-style amenities including a pool with swim-up bar, fitness center and separate yoga studio, and a dog park. 2850 Fannin St. is along the MetroRail and opposite the new Midtown Park, with more than 1,200 sq. ft. of green space and a retail plaza. Construction began in November 2017, and there have been around 425 tons of concrete poured, which is almost five-and-one-half times as heavy as a space shuttle. Residents are expected to start to move in summer 2019. For more information, visit hoar.com.